Motorvalley and Panini museum in Modena, Italy. The Motorvalley runs through the valley, crossing “via Emilia” to the Modenese countryside, where the “Hombre” farm is located. 330 hectares for 500 cows, all managed by a young farmer from the lowlands, Matteo Panini. He belongs to the last generation of farmers and thinks of himself as the last olive left on a tree that was planted many years ago. He’s Umberto’s son, the same Umberto who, together with his brothers Benito, Franco and Giuseppe, invented Panini stickers, cultivated the land and a passion for motors. So, Panini’s motorcycle and car collection started with tractors. We can find, for example, a Landini from the year 1934. According to Matteo Panini, it’s one of the best and it still works perfectly. This is where the legend began: tractors were like wooden logs, carved repeatedly until the most beautiful cars in the world were created. These are classic cars, the crown jewels of Umberto and Matteo Panini’s collection. The collection consists of three so-called branches. The first one is Panini’s Maserati collection, which is possibly thought of as one of the most important in the world today. The second one is the branch of vehicles that Umberto Panini picked up when people left their cars behind. Finally, there’s more or less a hundred motorcycles, the means of transportation people once used to start with. Matteo starts by showing us a Maserati Moto. Not everybody knows that there was a Maserati Moto in Modena. His father used to work there at first, and he was the Experience Department manager: that is, he would ride a motorcycle until it broke. Just like a test pilot. But then Umberto became a Maserati car collector. An important vehicle for Maserati is a 1958 car built specially for the brand “Camillino Eldorado”. 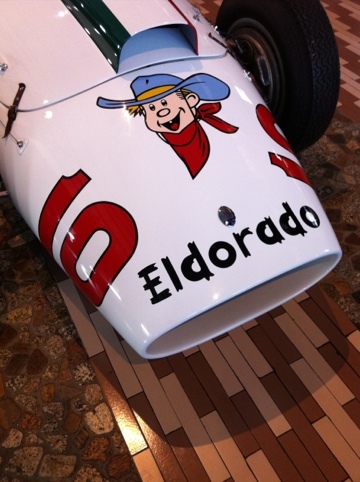 Eldorado used this car like it was a modern marketing tool. It’s a big cream white “ice cream” featuring a 8 cylinder 4200 cc engine, which was once driven by Stirling Moss. Another important car in Panini’s collection is the 250F, a single-seat car, seen as Formula One itself. It portraits perfectly how cars from the 50s were like. Driving this model, Fangio won the World Championship. Maserati managed to put a 12 cylinder 2500cc Formula One engine right there, thus exhibiting in 1957 an engine that was light years in advance of 6 cylinder ones. When asked why the tachometer is installed inside out, he explains that the driver has to look ahead, so the pointer has to be straight up when reaching 6k, 6,2k rpm. When the pointer is straight up, you know you have to change gear. Then there’s the Maserati Birdcage. Its frame is so daring in terms of manufacture , it’s made up of 200 steel tubes, that make it look like a net. Because of its reticular shape, in English it was called “birdcage”. Thanks to this car, with only 22 models built, Maserati became very popular during the World Sportscar Championship, that once was possibly more important than Formula One. Matteo says he used to drive and still drives this model. We can also find a Stanguellini car. Matteo explains his father worked as a pipefitter for Stanguellini, so that’s the reason they’ve got to have one of those. Besides, the Stanguellini museum, one that true fans shouldn’t miss, is a few kilometers from here, in Modena. The Panini collection isn’t just made of cars and motorcycles. Matteo shows us a bike which was used by light infantry soldiers. It’s a modern mountain bike, with front and rear shock absorbers. By switching the front wheel with the back wheel, you can also change the gear ratio. He says he likes to think that the person who built it thought it had to be unbreakable. It can also be folded, showing the practical way people once conceived things. The motorcycles are located on the second floor. We can find a wide range of motorcycles, like the Guzzino, the Formichino, the Ducati Cruiser (designed by Ghia), which is a really rare item, the Galletto, which was commonly ridden by priests, the Lambretti Vespa, the Delfino Motom, the Aquilotto. There’s also a parade of British motorbikes, from Norton, to AJS, to BSA. According to Matteo, in Italian BSA became the acronym for “Bisogna saperci andare” (You’ve got to know how to ride it) and in reverse, “Anche senza benzina” (Even with no gasoline). Speaking of British, there’s also a Welbike, the bike for parachute drops. It could get folded and placed in containers which were located right under the aircraft’s wings. And speaking of aircrafts, we’re shown a Messerschmitt car, that truly looks like the cockpit of a Messerschmitt aircraft. With regards to torpedoes, there’s also a missile-shaped Lambretta. According to Matteo, it was probably able to reach 200 km/h. There’s also a Lotus leaning against the wall, far from the rest. The key is simple: we have to enjoy the Panini collection in small amounts, taking our time. Speaking of the relationship between motors and land, our last stop is the farm. Matteo says the farm is like the dynamic part of this passion, with its 500 cows thanks to which 12 wheels of Parmigiano Reggiano are produced every day. Motorcycles, motors and wheels of Parmigiano all have something in common: you recognize them from their sharp sound. Matteo agrees with that, adding that engineering is also involved. For example, a hammer can have different weights, and depending on its weight and where you put it, it can give you different feelings and vibrations. And they ask why this is the land of mechanic and motors. Hello, i’m loocking for a sticker camillino eldorado like the one on the car. My father had one on his old VESPA. He has a new one that is doing up he wants the give it the same loock that the old one. Can yo help me ?